The homeowners’ association for Abbey Court Apartments announced on Tuesday that they had relaxed the complex’s towing policy and asked residents who had been denied parking permits due to vehicle appearance to reapply. According to the press release from the homeowners’ association, dated July 29, the association decided to relax the rules regarding the appearance of vehicles more than a week ago. Earlier this month, Abbey Court began towing vehicles that were parked in the apartment complex’s lot without permits. However, many residents were denied parking permits because their cars have dents, need paint or have a cracked windshield. Residents are also required to present documentation that they are a leaseholder or authorized occupant as well as vehicle registration information. According to Brad Chandler of Chandler’s Towing, the company contracted to tow vehicles illegally parked in the lot, the company has towed 29 cars from Abbey Court’s parking lot since July 17. Residents of Abbey Court have said management unfairly discriminates against Latino residents, many of whom are working class and cannot afford to fix their cars. Ricardo Lazaro, a resident for 12 years, said he had never had a problem with management at Abbey Court until now. Last week, Carrboro Mayor Mark Chilton asked Lucas to stop towing residents’ cars, but Lucas refused. According to Chilton, Lucas said he was concerned that some people were parking there illegally to catch the bus to downtown Carrboro. In addition, according to Chilton, Lucas said he was concerned that there are people living in some of the apartments who aren’t on the lease and that he was trying to use the parking permits as a method to determine where people are living. Chilton called an Abbey Court residents’ meeting on Sunday, where he explained that the town did not have authority over the complex’s parking lot, but encouraged residents who have problems with their apartments to file complaints with the town and request inspections. The town has inspected six Abbey Court apartments and has found violations in each unit, all of which lacked smoke detectors. A representative from the Pittsboro office of Legal Aid of North Carolina was also at the residents’ meeting and several residents are meeting with the office to determine if any action needs to be taken. The county’s Office of Human Rights and Relations is also investigating the situation to determine if there have been violations of the Federal Fair Housing Act. Violations of the fair housing act include actions that discriminate against a protected class, said Shoshanna Smith, director of the office. “We’re looking to make sure that people from those classes aren’t being discriminated against,” Smith said. Protected classes include race, religion, national origin, English-speaking ability and more. Smith said her office never asks those who come to them for citizenship documentation, in accordance with Title VI of the Civil Rights Act. “We’re proud of the fact that we can help everyone,” she said. The office has not launched a formal investigation yet, she said, because once they do so they have only 100 days to complete it. Some residents, many of whom are illegal immigrants, have said management has started rumors about calling immigration officials. 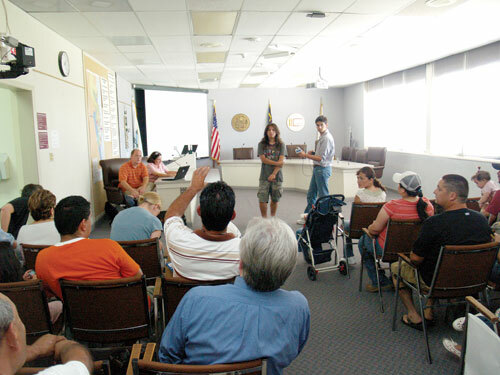 “[Lucas] takes advantage of us because we are Latinos,” said resident Iris Maribel Arias. In the press release, Lucas said many residents had already received parking permits. In an email to town officials, Lucas denied the allegations that management was discriminating against Latino residents. Aldermen Dan Coleman and Jacquie Gist called a special meeting of the board of aldermen for 7:30 tonight (Thursday) to discuss and possibly enact a proposed ordinance regulating the towing of automobiles from private lots within town limits. The ordinance would be similar to one enacted in Chapel Hill, which limits towing fees to $100, vehicle storage fees to $20 a day and unhooking fees to $50. Chandler’s Towing charges $150 for vehicles parked illegally or abandoned vehicles, $30 a day for storage and $100 for unhooking. The storage fee is applied as soon as the vehicle is brought to Chandler’s lot, so owners must pay at least $180 to get their cars back. The new ordinance would prevent companies from charging storage fees for the first 24 hours. Coleman proposed an ordinance for Carrboro after Chapel Hill passed its towing ordinance earlier this year and called the special meeting to revisit the issue in light of the recent towing at Abbey Court. The board will discuss a possible ordinance tonight at the Carrboro Town Hall.